I heard that CN was going to be switching Cargill at Helene, so I grabbed my camera and drone and headed out. Here’s the story, in pictures. 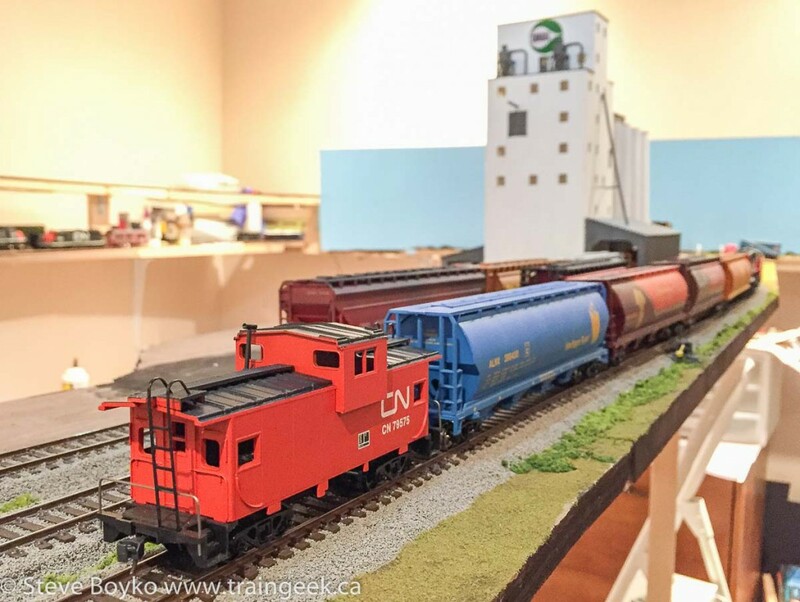 I first caught CN 4497 Extra heading out of Winnipeg with several grain cars and caboose CN 79575 in tow. 4497 looks like she could use a wash! 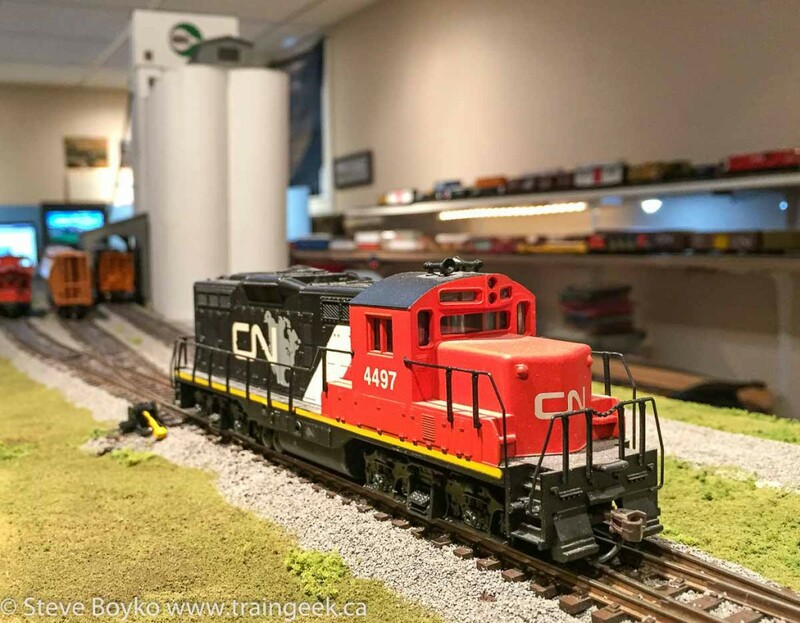 4497 rolled on past “Laptopistan”, aka where I do my work when I’m not playing trains. Note the Manitoba Pool Elevator calendars on the wall. 4497 Extra passed through Georgetown. 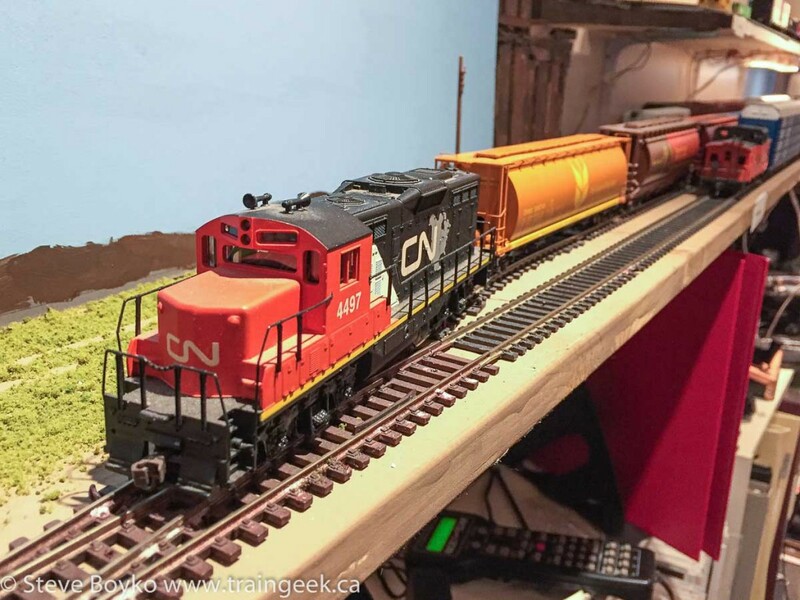 Here the train is passing the Irving Oil spur by the station. I lost track of the train until it started started backing into the Cargill tracks. Here the caboose is leading through the public crossing. This lost Wabash R.R. truck is parked a little too close to the crossing! Another view of the same crossing. The train has pushed back into track HI01, the incoming track for the Cargill elevator. This is pretty much what 4497 did, except there was a wrinkle – there was an empty car in HI03. 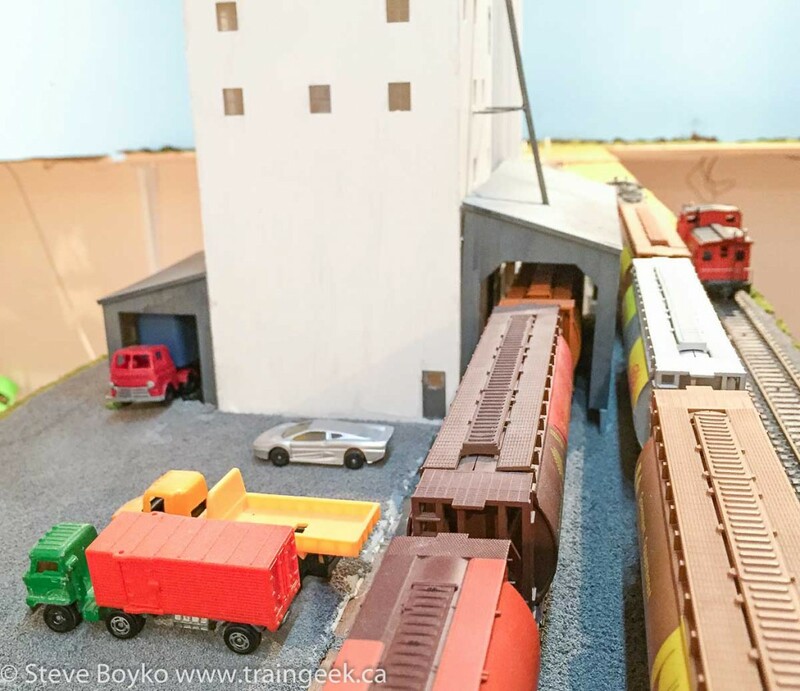 Cargill’s plant switcher was absent – probably for service – so that empty car didn’t get moved to get loaded. 4497 dropped the entire train and went to HI04 to grab the loads. Fortunately there were no fertilizer cars in HI05 so that simplified matters. I broke the drone out to get this overhead view as 4497 was dropping the loads on HI03. Note the lone empty car way back on HI03 that would have to be fetched. Since there’s a crossover switch, the plan was to spot the loads short of the switch so they could push the empties on HI01 back through the switch and couple up to the empty car. Here they have all the empty cars and are preparing to push back onto HI04 to spot the empties at the elevator. 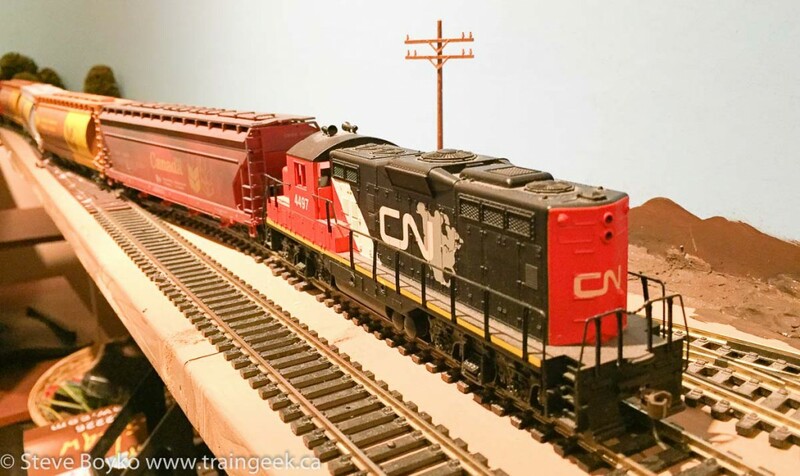 Fortunately 4497 doesn’t have to keep the main line clear for any scheduled trains at this time, because there is only enough track between the switch and the CN Rivers main line for the locomotive and three cars. When they have to clear the line, they have to spot cars in a couple of blocks or just wait for the train to pass. 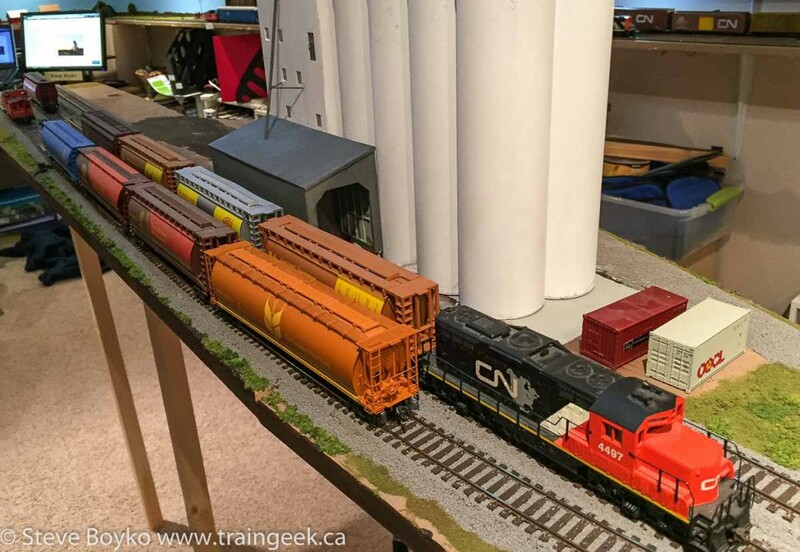 The cars are spotted and 4497 is ready to pick up the loads and caboose and head for home. A drone’s view of the elevator parking lot and cars. I caught up to 4497 again in Georgetown. They had pushed caboose first into Georgetown, and here 4497 is running around the train to put the loco on the head end. 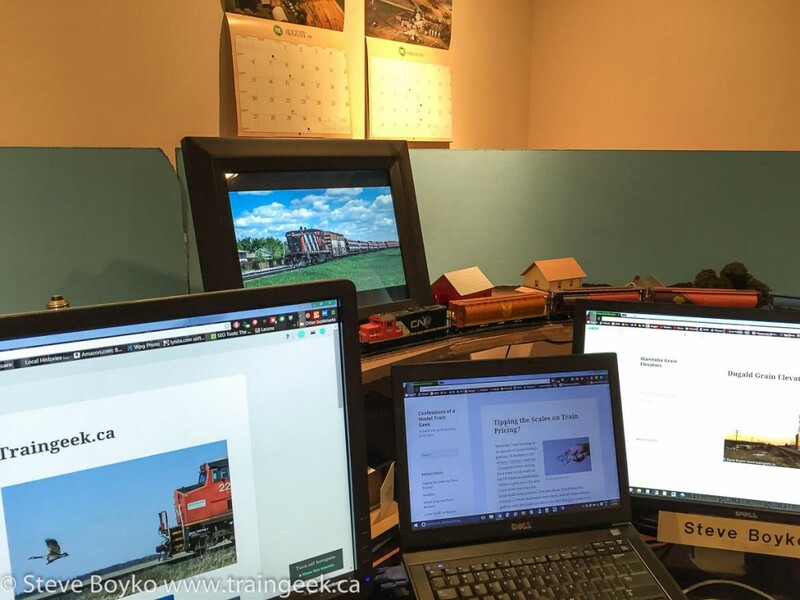 No doubt the crew is wondering why CP left an SD40-2 in Georgetown, but they don’t have time to dwell on that… home is calling! 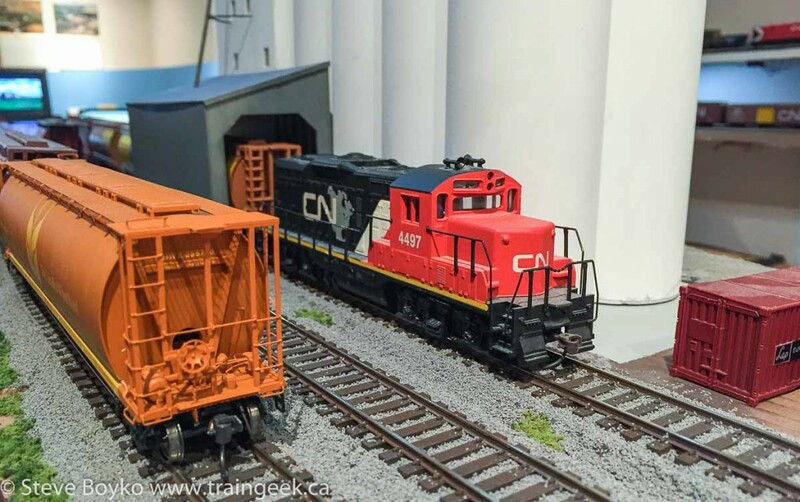 The runaround complete, CN 4497 travels back to Winnipeg and pulls into the yard with the loads. 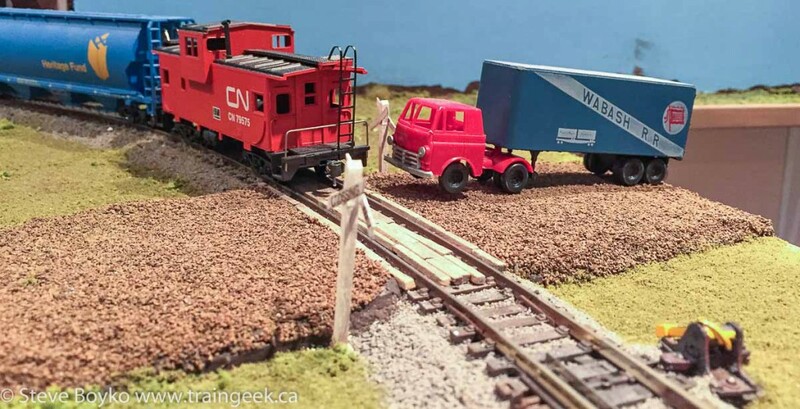 I hope you enjoyed this railfanning story showing CN switching Cargill on my layout. 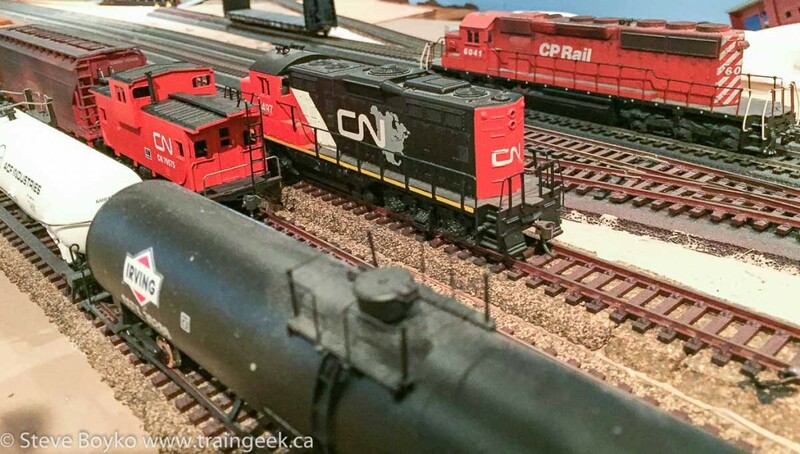 I have to give a shout-out to John over at the CP Rail Manitoba & Minnesota Subdivision – his railfanning posts like this one inspired me to follow my own trains.